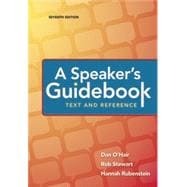 A Speaker's Guidebook is the best resource for public speaking in the classroom, on the job, and in the community. Praised for connecting with students who use it (and keep it!) year after year, this market leading tabbed, comb-bound text covers all the topics typically taught in the introductory course and is the easiest-to-use public speaking text available. Hundreds of instructors have shaped the book to focus on helping students overcome the fundamental challenges of the public speaking classroom. The Seventh Edition provides even stronger coverage of organizing and outlining and speaking beyond the speech classroom. This edition emphasizes skills critical to good speechmaking--listening, ethics, credibility, and persuasion. Print and digital tools converge in the Launchpad for A Speaker’s Guidebook to help students with every aspect of the speech building process with a gorgeous, new collection of speech videos, accompanied by questions, to model speech techniques. Audience Analysis and Topic Selection? 12. Types of Organizational Arrangements? 18. The Voice in Delivery? 20. Using Presentation Aids in the Speech? 25. Developing Arguments for the Persuasive Speech? 26. Organizing the Persuasive Speech? Speaking Beyond the Speech Classroom? 29. Collaborating and Presenting in Groups? 30. Business and Professional Presentations? F.?Preparing for TV and Radio Communication?